I listened traditionally that function follows form. Others argue the opposite… form follows function. What is important is that morphology and biomechanics are sisters twins. The morphology, or the phenotype, is the visual expression of the genetic code. The angles and the length of the bones, muscle mass associated with these and the proportions between them obedient to a genetic code, allow the expression or the functional specific biomechanical characteristics of individuals, who share in a good percentage, common genes. This pattern sets the sequence of the footprint, the times of support and suspension of each member and the relative position of the four members in time and between them, or the dynamics of movement or functional biomechanics. Marked angularidades of the bony radii, accompanied by good muscle mass in the lumbar region, rump and in the posterior region of the thigh (your buttock), can be used to predict a certain ease in the movement of the hind limbs, as well as the backs oblique classically have been interacting with lightness and amplitude in the movement of the previous. Since the riders have always chosen the horses according to a mission or function. This specialization led to cross animals with common characteristics among themselves, increasing the likelihood that similar genes are present in future generations, leading us to the consolidation of breeds with similar functional skills and at the time, took us to the consolidation of forms as a result of the repeated function. The breeding of purebred animals increases the likelihood that these characteristics morpho-functional are expressed in the product. The body shape and the proportions of its parts influence the expression of the horse in its various aires, further cementing the relationship between a given morphology and functional skills. In the case of the Peruvian Paso horse (CPP), we started to delve into a function, looking for the softness and the forward as particular characteristics and functional requirement to fulfill the purpose of moving efficiently from one place to another, much earlier than the engine could compete with meet this need. Animals that did not have the form that would enable them to meet the requirement of the function failed but a few survived. This selection directed through decades and generations made that the survivors have adapted their ways to make your job easier. As Darwin proposed, the selection does not favor the individual stronger but the one who best adapts to the changes. As well our horse adapted their ways to the function you are looking for. Smoothness and forward product of harmony and execution. Important rescue the undeniable truth that a function without a way as to allow for a natural implementation it leads to disaster early, giving way to untoward comments on the weakness of the Peruvian Paso Horse. Then, apply as a problem of race itself the problem of the individual who does not have the phenotype to the appropriate functional expression that he is bound by the tradition through genetic selection. The function itself has contributed to attach a form which is in line, does not contradict, this execution, under compulsion and fixed through generations, to achieve the function that is the distinguishing feature of our horse, dynamic movement known as floors. This ideal form is recognized in the pattern of current race since 1990. The direct correlation of form and function, we can now better understand the reasons that defined this morphological pattern. Those animals that cater to the morphological deficiencies with the heart (brio) to display a function required by the rider, tend to be short lived. Then we extend the concept and the direct relationship of form-function to form-function-health. I think it is a mistake to try to differentiate between races using only a static pattern, which uses the morphology (shape) as the main tool to distinguish between them, leaving the function as a subsidiary result because the verbal description of these morphological characteristics generally uses adjectives broad and often subjective (loin muscle with good coverage, kidney well kingdom, rump provided… ). This broad description then allows that qualify with the referential framework animals with big difference in the function. If you eschew the alternate pathway, with adjectives to describe the function and accurate then we refer to the form that is required for this function is expressed in a natural way and promote the health, we would have a better sieve to separate the animals good from the bad and those who should be selected as players (ACE) through time. That is why it is now our challenge to complement the morphological pattern of the race with a functional pattern, making evident their intimate relationship. The height and volume of the anterior third compared with the subsequent moves the center of the horse’s gravity influencing their natural balance and stopped moving. The skeleton of the horse form three natural arches, the neck formed mainly by the cervical vertebrae, back – Grupa formed mainly by the thoracic vertebrae, lumbar, and sacral merged, and the arc of the queue formed by the vertebrae mineralization had. The skeleton of the horse at rest form a long arc, not a straight line. These arches are not visible, but mainly formed by the vertebrae of the spine. We are visibly convex arc formed by the horsehair and neck, which takes its contour of the nuchal ligament, which binds to the arch the back spine that has a visible line straight or slightly concave. This apparent difference between the vertebral arch and the visible line of the dorso-spine is due to the fact that the thoracic vertebrae have some dorsal processes high on which are inserted the ligaments that support the back. What is important from the point of view of creation is that these visual arches are well followed, without sudden changes in the contour or breaking points. The rump to turn round, wide (back view) and long (side view), how to turn a muscular arch which begins in the sacrum and ends in the hock. The back (scapula) long and tilted in the horizontal plane, well muscled, facilitates carrying legs forward (extension) and upward (termino) in each movement, because long muscles to contract more, move legs more than short muscles. The scapula is the basis on which everything rests the previous member and is not attached to the skeleton for a joint “bone to bone” as if this happens with the hind limbs, but that is tied to the ribs and thoracic vertebrae by muscles and ligaments which in turn generate the movement of this when they contract a muscle group (chest) are responsible for sustaining the scapula so that you will be able to withstand the weight of the chest that “icing” like a hammock (effort of support) and the other muscle group moves the scapula for forward and backward, up and down, in addition to a semicircular motion (serrato, latissimus dorsi from below and trapeze above) and all these movements Influence through the shoulder joint the other bones of the previous member. Also, from the point of view of trial morphologically, lack or excess of developing some of these muscle groups will give us clues of functional performance. For example, a trapeze very developed will give us an accurate track of an animal that moves “resting on the shoulders”, an effort equivalent to a circus trapeze artist to climb a rope. There is less tension between in these muscles, the greater will be the pivot around which exercises the scapula on the humerus (shoulder joint or slant-humeral), generator at the same time of the looseness or movement of the elbow joint (humerus/radio), directly affecting the lift, extension and termino in general and positively affecting the length of the stride of the earlier ones, which needless to say, is consistent with the length of the stride of the front legs. The action of the rear legs is harmonious with the operation of the back, rump and rear legs; hence the importance of this harmony to the correct gait. The upper arch of the scapula has a greater range of motion when the back is leaning generating the size and scope of the previous members, damping increased forces generated by vertical vectors and therefore, greater smoothness of floors. A vertical back relates to lack in the damping capacity during the bearings and is manifested in horses that have a “tip of the shoulder” (joint slant-humeral) diffuse or less marked. Not only affects the angle of the scapula but the long. A short scapula that maintains the insertion point in the same forces an increase the angle of the humerus. A scapula 15% shorter implies a humerus 15 degrees more vertical. This combination is not favorable because it reduces the amplitude of movement. The humerus is the component of the previous member that contributes most to the ability to move the knee down when the member is suspended above the generating extension or scope. A long scapula (back) and a long humerus (arm) allow lift and extension as the movement of the humerus pulling the elbow joint and all the radius (forearm) forward producing the extension and the fluency, understanding the fluency as the ability to move the elbow forward (away from the sternum forward) causing the extension of the radius (forearm) and influencing the length of the walk and consequently the forward. A humerus works as an axis to move generates an arc. A longer bone, with the same energy generates a higher arc, with the direct influence on the movement of all the previous member and therefore the length of the walk, inducing the cadence or pause and as a result greater progress because it requires less amount of raids to travel the same distance. The sloped back accompanied by a long humerus, has the effect of walking backwards the humerus articulation-radio (knee) and this in turn dictates the aplomb previous, therefore we speak in the breed standard of being slightly camped in of the forlimbs. Animals with vertical shoulders or a horizontal humerus have a center of gravity more advance or animals with a very horizontal humerus show a tendency to rely on the shoulders. A long and horizontal shoulder has the ability to project toward the front. Therefore, the breed standard of the Peruvian paso horse mentions the shoulder tip being robust and outgoing. The length of the neck, back, upper arm (humerus) and forearm (the radius) induce a long stride with smoothness and elegance, or is that determining the style of movement and athletic ability of the horse. When we talk about a camped in front legs, it is important to remember that this should always be vertical. Or, that the previous member this camped in, refers to the fact that it is behind the vertical line with reference to the whithers. This position “close” makes more dramatic figure tip outgoing shoulder also referred to as “pigeon breast”. If in the previous members is desirable the good conformation, in the back legs it is vital, since the bulk of the force required to move and impulsion is generated in the posterior third. That is why it is said that the horse has “rear engine”. A long back has a lower load capacity and is more prone to injuries that one short and muscular. The most important articulation lumbo-sacral, (commonly called kidney area, because the kidney is located within the abdominal cavity below of this articulation, -but it has nothing to do with locomotion of the horse). When we say that an animal has good kidney we’re referring to having a muscle ileus-psoas powerful, able to flex the knee lumbo-sacral. This area should be short, broad, well muscled which is inserted in the dorsal processes (above) and coverts (horizontal) of the lumbar vertebrae that have a guidance forward to allow the ligaments act as pulleys when the iliopsoas muscle is contracted and Jalan insertion in the internal side of the Ilion. This joint is the important to transmit the force generated by the subsequent forward and that determines the athletic ability of the horses. The pelvis, bone formed by the merger of the ilium, ischium and pubis, form the rump and is the main responsible for the meeting of horse to move. The length, width and musculature associated to this bone, gives roundness to the rump and strength of the movement of the post. A femur also long and sloping (when the angle between this bone and the horizontal at 18 to 22 degrees) facilitates the work of muscles of the ventral Babilla and oblique (rectus abdominalis) to pull forward in the subsequent phase of suspension and place the back legs under the body. This inclined angle of the croup promotes the ability of bending the knee coxo-femoral, tucking subsequent forward just below the center of gravity achieving stability and recovery of balance. The hoof anchored in this position, allows a longer stride and collaborates to the muscular contraction of the masses located by “back” of the femur, in the support phase, which will generate greater traction causing the driving force. The inclined angle of the pelvis, is also manifested as mentioned in the breed standard, in a low tail set, below the horizontal line that passes the tip of buttocks (tuberosity innominate). A hock (tarsus) clean and strong with the adequate angle is going to help this goal to have impulsion in the hocks. Thus we say that this articulation, viewing from the side, resembles the hands of a clock that marks the 11:35, being the ” 11″ the tibia and ” 35″ the cannon bones. This conformation might be considered defective in other breeds with different functions, but entirely appropriate to achieve a comprehensive stride and gait, without vertical vectors that results in wasted energy. Hocks which are behind the mass of the body, indicated by the tip being behind the point of the buttock, are unable to push the subsequent generation of minor stumble and impulsion, base of the forward. Hocks that travel without vertical vectors promote a movement more efficient by not having energy release vertical, which does not contribute either to the forward movement or the smoothness since all vectors ascending tend to generate an opposite effect later, by the law of gravity. Cannon bones (third metacarpal in previous and third metatarsal in subsequent) short and thick are associated with tendons flexors and extensors stronger than rods long and thin. The alignment and the angle of the joints of the pastern joint and fetlock (first and second phalanx) allow the cushioning at the start of the phase of support and the release of the elastic energy at the end of the same, generating the genesis of the forward drive. Then, as we understand the driving force that is generated by the action of the rear legs in the second part of the phase of support (being the first phase simply restoring the balance). This force is generated by the release of energy, which precisely was accumulated in the bottom of the posterior third (ligaments) to recover the balance or first phase of the support that just happens at the end of the phase of suspension or protraction of the hind limb. It is at this stage of suspension, where the execution should be done with decision, so that the hind limb is located in the “soil” as far forward as possible, “below the body mass” and will contribute to the long of the gait. Very short pasterns generate a short arc of movement (pile-drivers) and the very long are prone to generate injuries by allowing the back of the fetlock by weakness reaches to touch the ground and generate greater stress on the ligaments flexors and extensors of the hoof. More important than the length of the phalanxes per se, is the weakness of the ligaments that already error it would be if we associate the weakness only to the length of the phalanges and do not take also into consideration the constitution of the ligaments, basically the relationship of elastin and collagen own of the individual and in turn is determined by the genetic code. Therefore, the pattern mentioned pastern medium in size, approximately 9-11 cm. Size, shape and correct angle are fundamental to the quality of movement and longevity of the animal. In summary, in the front legs, long shoulder angle, forearm long pastern and medium with an angle equal to the angle of the scapula. In the rear, a tilted croup, long femur, long tibia, short cannons and medium pasterns. Long from the tip of the hip to the hock and short distance from the hocks to the ground. A neck inserted very “low” is in a humble position of the head and a tendency to “move over the shoulders”, even worse, relatively unable to tuck the rear legs and generate impulsion. Long necks, inserted higher allow more looseness of shoulder blades, more and more fluid extension of the front legs. 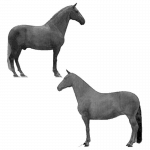 For this reason we find that the Peruvian Paso horse, seen from the side, can be divided into 3 parts of equal length: (a) of the tip of the shoulder to the whithers, (B) top of the whithers to the tip of the hip (tuberosity innominate) and (C) of the tip of the hip to the tip of the buttock (tuberosity rump). For that to happen, the animal must have the volume to enable it to accommodate a long scapula, a short back and a long croup. We are talking about also that the horse can be divided into 2 parts of equal length on the vertical axis: (a) of the cross to the sternum (breastbone) and (B) of the sternum to the ground. The total length (shoulder to the edge of the buttock) equal to the height of the withers. The height at the withers (spinous process of the fourth thoracic vertebra) should be equal to or slightly greater than the height of the croup (top of the sacrum). Otherwise, the center of gravity moves forward by making it more difficult for the horse reaches the post under its mass, what will determine the impulsion and the advance. The way to coordinate their four legs in a given speed, the trajectory of the hooves in the lifting phase, the way of supporting the hoof in the ground, the ability to tuck the rear legs under the body, the amplitude of the gaits, the degree of dissociation of the lateral steps, depends on both the genetic code (to do) and the morphology (as it does) and acting together, to achieve the smoothness and the advance that characterizes the breed. The collection allows the horse to move and carry the weight of the rider on his back. When the animal is “round”, the first phase of collection, it tilts the pelvis at the joint action of the lumbo-sacral initiated by the lumbar muscle contraction of the ventral iliopsoas and the contraction of the rectus abdominis (stomach muscles), which pulls in the inner part of the pelvis, tipping is, which in turn pushes the femur has craniomaxillary (forward) and starts the phase of protraction of the rear. This starts a series of changes of position that van in cascade forward, among them the basis of the back arches convexly to withstand the weight of the rider (effect scale), the base of the neck formed by the articulation of the sixth cervical and first thoracic vertebra is raised by the action of the longus colli muscles and scalene that are located at the bottom of the cervical vertebrae, allowing the telescopic position of the neck and the support that complete or joins the arch formed from the neck of the later to the hand of the rider. The locomotors pattern preset by the sequence and coordination of the four members that is repeated cyclically is called aires. The step is the slower speed. In each cycle, the horse performs the same movement with its two sides of the body by what is seen as symmetrical. The duration of the phases of support and suspension (protraction), as well as the phase of lateral support and the transition to support diagonal is equal to what is also called a synchronous speed. The paso llano, or pisos, is the cyclical repetition of eight steps or patterns according to the position of its legs in the phase of support, so that there are four triple supports, two double supports diagonally and two double supports laterally in permanent contact with the ground and with a constant sequence. In the case of the diagonals steps, the front leg and back legs almost touch, opposite to trot where in the diagonal supports the front (suspended) is totally away from its rear diagonal (in the final phase of support and impulsion). In the Peruvian Paso or pisos, the lateral supports last longer in time that the diagonal supports by what is also called an asynchronous speed. The dispersal of the force generated by the weight of the horse and the rider in these eight cycles of steps is the basis for the typical smoothness of the breed. This difference in the time of lateral support versus the time of support diagonally determines the quality of the pisos and difference of an ordinary pisos. In the trot, where there are few moments of total suspension, to the return to the phases of support, it generates an impact that is not presented in the case of paso llano and that is why the paso llano is much smoother for the rider. In the walk, paso llano and the sobreandando sequence of support and suspensions is always the same: PI-AI-PD-AD, marking the difference between them the growing time or late arrival to the ground from the previous versus the later ipsilateral. In the case of the trot this sequence would be PI-AD-PD-AI. It is for this reason that in animals which, of course, was moving at a trot, as they walk to the footprint of the walk later never exceeds the footprint of the previous of the same side, because when the later phase ends and starts the lifting phase of support, the previous one of same side has not entered the phase of suspension and achieved. When they move to the step (stride), animals that naturally tend to trot, are going to form a “V” visual when the later seeks to achieve the above same side. When its movement tends to the side, both members move forward with synchrony to exit both hooves from the ground at the same time and therefore does not form the visual “V” as happens in the trot or movements with diagonal trend. The center of gravity or balance point always looks for the center of the legs who are in support. The space that a horse covers in a complete cycle of movement is the amplitude of the gait or distance between bearings and the number of raids in a given time is the frequency of the timing. The duration of the phase of support in the gait is an indicative of the quality of the pisos. Those animals that in their displacement give slower steps (less frequently) and more harmionous, but at the same time longer strides and in its time of support, tend to be more powerful in more demanding conditions, to express a greater performance with a minimum of effort. The opposite happens in breeds of animals characterized by displacement in trot, where the duration of the phase of suspension is a quality indicator. To increase the speed of gait, the horse tends to increase the frequency of the steps. But it can also maintain the frequency increasing the amplitude of the steps. For this reason, the horses in the paso llano must overreach to a greater extent than the walk. When more overreach of the footprint is achieved, the more posterior displacement of the center of gravity and greater weight download on its posterior third, facilitating the push and the load. On long journeys, we prefer to have a horses stride extended to those who to move to the same speed they need a greater frequency of steps with reduced amplitude (repeaters), since they are a muscle expenditure (energy) higher, and that in equal physical conditions, leads them to manifest symptoms of tiredness with greater promptness. The force necessary to drive the movement comes from in most of the propulsion that front legs release during the support, the result of the contraction of the muscles of the region of the loin, rump and in the posterior region of the thigh (buttock) and therefore the importance of the formation of these areas. In the “first half” of the phase of support, the pelvis, the hock joint (tarsus) and the fetlock joint later become authentic deposits of energy storage to receive the weight of the animal and rider; also known as equilibrium phase. In the “second half”, this stored energy is triggered by the action of the muscles of the subsequent (rump and buttock), causing the extension (opening) of the joints and maintaining the fixed hoof as the anchor in the ground, forcing the displacement the mass of the horse forward, also known as driving phase, in large part of the promoter of the typical forward race. The ability to place the hind limbs as close as possible to the projection on the ground of its center of gravity is important because the action of traction is more efficient. At the start of the phase of sleep, the muscles of the womb, the oblique muscles of the ribs and in the region “kidney” (lumbar area) that are inserted into the pelvis, is collapsed and the pulling forward, increasing the degree of natural inclination and with this, pushes the femur which in turn has a tilt and forward direction (cranial nerve VII), boosting all the subsequent forward, so that the hull will place well ahead and below the ground starting the first part of the phase of support. Immediately followed by the muscles of the hip and buttock are collapsed generating drive and stay in this phase until the hock reaches its maximum aperture and the helmet back off the ground to start a new cycle. This is why the last hoof in peeling off of the ground is the one that generates the pulse. As the sequence that begins in the vertebrae has a direct impact on the function of here the phrase that the dynamics of the shoulder and back governs the dynamics of movement to the point that we should describe the meeting and no extension in terms of the action of the members but also to the action of the back. For this reason, the morphological pattern of the peruvian paso horse speaks of a short back and well coupled (popularly described as a good kidney), muscular with good croup, a long rump, wide and muscular and region sub-sternal parallel to the ground (good volume) opposite to animals who are “far from the ground” or “wasp waist”. Muscles are the only tissue that contracts when stimulated by nerve impulses. Functionally, this muscle contraction that allows movement of the post in parallel has the effect of “pushing up” the entire vertebral column, producing the collection to help carry the weight of the rider. In well gaited animals, the stride of the rear legs is accompanied by a stride similar to the front legs (extension). The elongation of the neck and the action of the muscles longus coli and scalene, constricting the shoulder (scapula) and upper leg (humerus) forward and favor a “long stride”. The main factor for a particular function is the conformation, but we must recognize that the training, the condition of the animal and the action and position of the rider has an effect on the biomechanics that warrants further consideration. That is why in the judgments of the peruvian paso horse, the judges first study each animal individually, by comparing them against the morphological pattern and with the other subjects in the arena, to then supplement their fault with the functional assessments, prioritizing virtues and flaws that would allow us to classify the animals in the arena on the basis of their quality.